Our local library does a pretty good job of displaying African-American books in prominent places. The girls and I were browsing for books during a recent library visit and a book I’d never seen before caught my attention. I picked up, flipped through, and quickly checked out Finding Langston, a new work of fiction by Lesa Cline-Ramsome. The book is only 107 pages long, but it is an interesting and inspirational read. The book is set in 1946 and gives readers a peek into the life of eleven year old Langston, a boy who has recently moved from Alabama to Chicago during the Great Migration. Langston and his father must adjust to life after the death of Teena, their beloved wife and mother. Langston’s life takes an interesting turn when he visits a library for the first time and discovers another Langson in the pages of a poetry book. Though it is a short read, Finding Langston addresses age old issues such as bullying and self-esteem while exploring the complexities of loss, friendship, and family. Ransome brings Langston to life through lively, poignant conversation and genuine interactions with fellow characters. Elementary through middle school age students will be intrigued by Langston’s story and find that his experiences open the door to in depth discussions about child/parent relationships, death, and friendship. I’m planning to have my daughter read the book, so I created a literary study guide to accompany the book. I’m happy to share my creation with you today. The literary study includes prereading activities, comprehension/discussion questions, and extension activities. 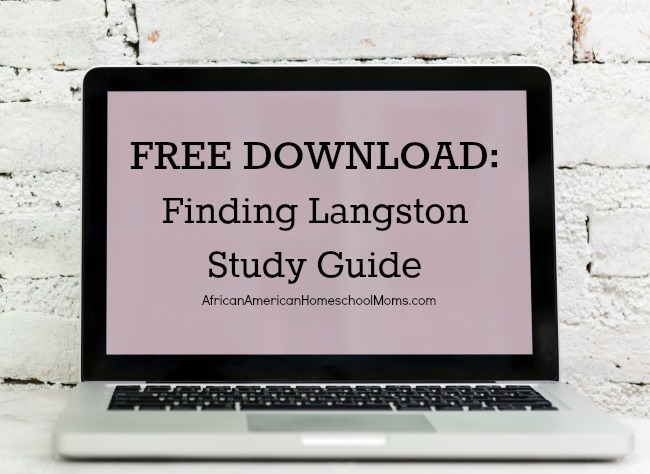 Click this link to download your copy: Finding Langston Study Guide. This is an awesome resource that we will definitely use this semester. Thanks for creating this self-contained all in one study guide. Thank you so much for all that you do. We, African homeschoolers, need more moms like you to keep the family strong, positive, and aware. Stay blessed.